At last week’s iPad 2 keynote, those of us watching and waiting for evidence of new features for Apple’s Keynote presentation software received both good news and bad. The bad news was that we saw nothing new beyond that which we’ve seen in the past year of Keynotes from Apple. In fact, we saw less evidence of the inclusion of new effects when compared to the keynote introducing the iPad 1 in January 2010. The good news – by inference – is that the next update to Keynote has been baked and must now be cooling, ready for serving. What’s holding up its delivery to hungry Keynote users I would assert is a timing issue, rather than a development issue. Perhaps the next version of Keynote is tied to the release or update of some other Apple product, like MobileMe or iWork.com or AppleTV, before it goes to the public. Or perhaps, as I have suggested in a previous blog entry, it will be released when Keynote for the iPad 2 is released March 11 in the USA, March 25 in selected other Apple countries, and then elsewhere. Keynote 2 will move closer to parity to the existing desktop Keynote feature set to take advantage of iPad 2 increased horsepower, one assumes. 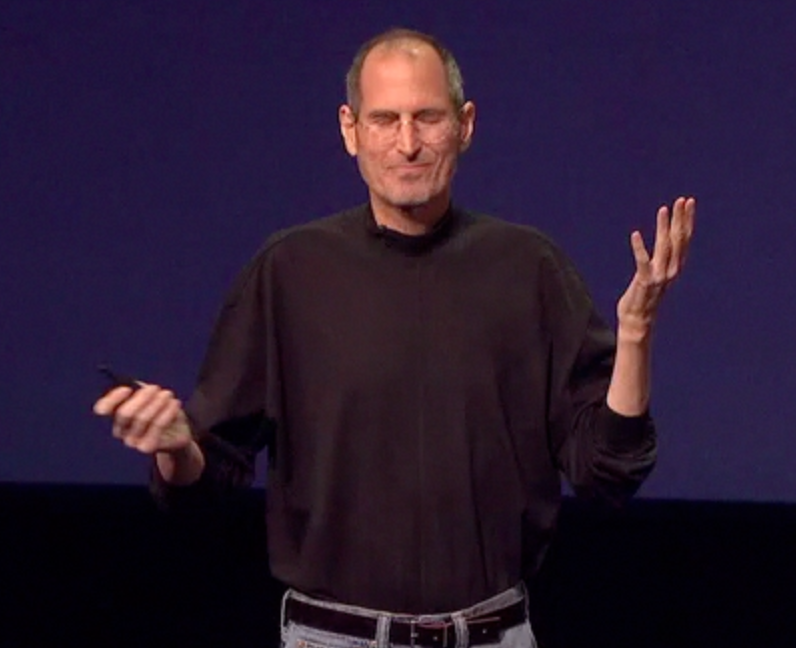 The other good news for watchers of Apple keynotes was the sprightliness of Jobs’ performance. Many had assumed he would remain on medical leave, meaning his usual deputies would give the show. Clearly, Jobs has deep affection for the iPad, seeing it as yet another disruptive hardware/software product from Apple which “changes everything” to use an expression from a 2007 Jobs keynote, when he introduced the iPhone. If you are a presenter who likes to watch others perform, for both inspiration, direct learning, or merely to admire expertise in action, this past week’s keynote is one to watch several times to truly add to your principles of presentation. While others may view the keynote to learn of the iPad’s attributes, presenters have an opportunity to view not one, but two masters of presentation in action. Jobs clearly is one of them, and while his deputies did a fine job, only one truly stood out as simply astounding. 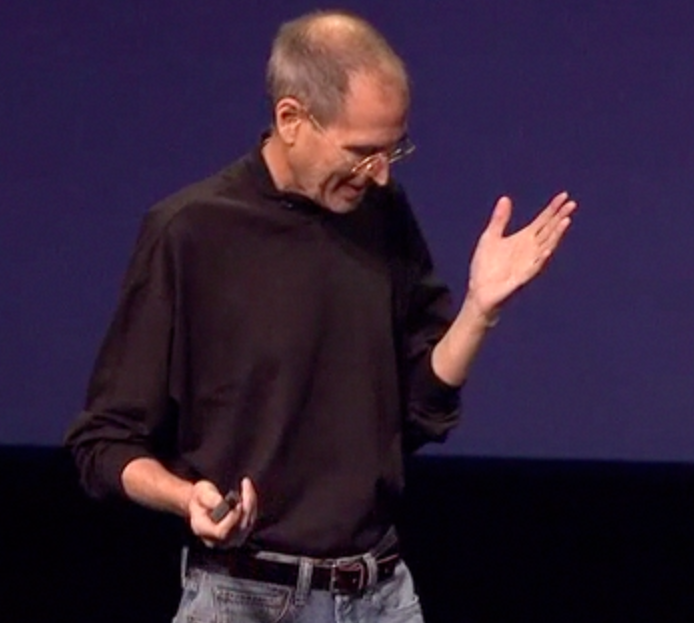 And when you watch Jobs’ reaction as he accepts the slide clicker at the end of his deputy’s presentation, you know Jobs has witnessed presentation magic on the stage. It would be easy to think he’s pausing in wonderment at what the iPad has achieved, but without a blow it out of the water demo I doubt his reaction would be such momentary muteness. I’m referring here to the presentation of Garageband by Apple Music Marketing Director, Xander Soren. You can see his presentation commence in the official Apple keynote podcast (you can subscribe to and download Apple keynotes in iTunes) at 47:30 when Jobs makes the introduction to Garageband. Before I make my pitch for the quality of his presentation, you should know Xander doesn’t get it easy. Not just does he follow Jobs’ presentation, but he is the third and last of the deputies to do a demo: he’s preceded by Scott Fostall discussing iOS 4.3, and Randy Ubillos, Apple’s Chief Architect for Video Applications demoing iMovie. What is also known is that Jobs demands perfection of his fellow presenters. His own legendary rehearsal routines are well known, and over the years until recently he has held the stage on his own for more than two hours without reading a script, merely using Keynote’s presenter display (where he can see the current and next slide – invisible to the audience) to cue him in. I use the same method, but it requires much rehearsal knowing what stories to tell for each upcoming slide, and segueing easily between slides and their stories. It gives Jobs’ presentation an almost personal touch, as if he’s in conversation with you. (I am still amazed at how many Powerpoint users are unaware it can also employ presenter mode, perhaps because until Windows 7, using another monitor for screen splitting was a pain). (At this point, I’ll share a fantasy I almost put into action at my first Macworld 2008 Presentation Magic workshop, a year after the iPhone’s release. Being an unknown at the time to Macworld audiences, I was going to appear from behind the very large projector screen, carrying a whole bunch of cue cards, approach the microphone, tap hard on it in a most amateurish way, and then introduce myself as Les Sigman, Stu’s nephew at which time I would “accidentally” fumble my cue cards into the air and onto the ground, where I would then stand frozen with fear. As it is, the talk still got plenty of laughs and the audience and I had loads of fun). Sometimes, this desire for presentation perfection means the keynote seems a little out of kilter, as if a product or more likely a person couldn’t meet Jobs’ standards and that demo was aborted. At other times, beyond his control perhaps, Jobs concedes the stage to a fellow CEO with hilarious results, as in the time in the 2005 Macworld keynote he introduced Sony President, Kunitake Ando, to discuss video products for what Jobs declared would be the Year of Video HD Editing. 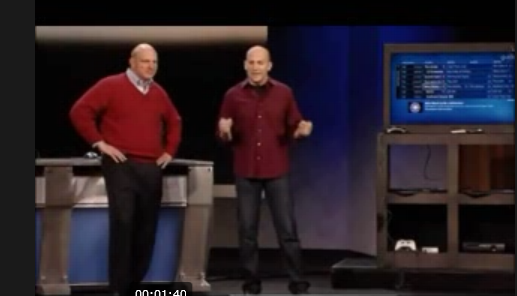 If you read the blog entry, you’ll see how I wondered aloud why Ballmer was so ill advised as to demo the tablet standing and holding it on his belly, working it upside down. It’s a perfect metaphor for Microsoft’s historic poor grasp of human factors and useability. I suggested in the same blog he ought to have sat in an armchair to do the demo, the way most people would be expected to use the device. Perhaps he was in such a hurry to get it over and done with, that sitting down would have drawn it out too much. A few weeks later, it’s exactly how Jobs, Schiller and others demoed the iPad. Let’s come to Xander now, after this rather long prologue, and why I believe it will be a long time before you see another presentation of a tech product that will surpass its quality. 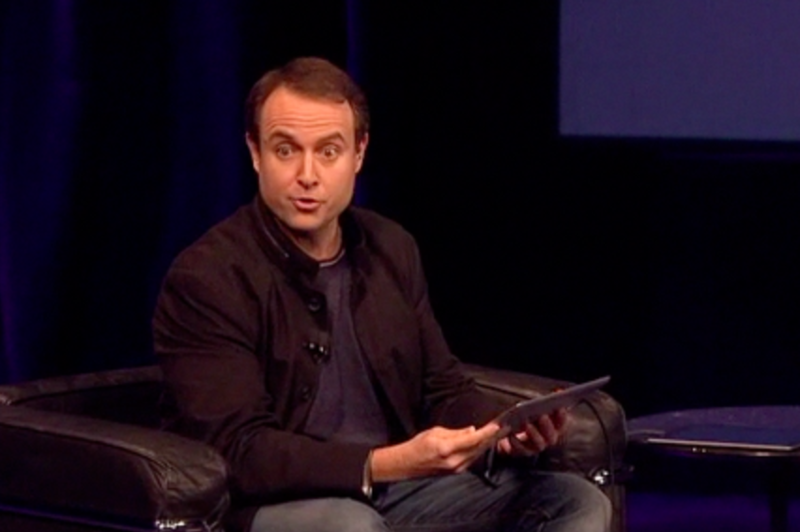 Unlike his colleagues, Xander (who has presented previously on stage at the Back to the Mac event in October 2010), went directly to the armchair and picked up the iPad to rip straight into his demo. At this point, we knew he meant business, yet he appeared warm, effusive and welcoming. 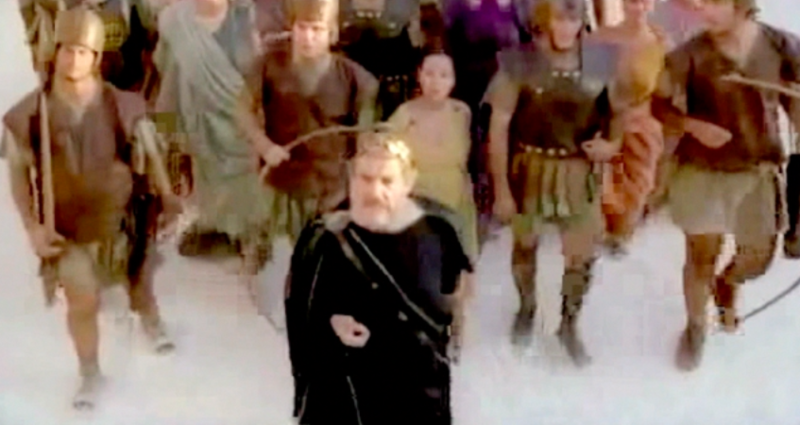 He had a tough task, moving his attention – and thus ours – between looking and working the iPad, giving eye contact to the audience, and occasionally looking up at the big screen behind and to his left, mirroring his iPad’s display. From there, he is word perfect. I don’t believe I caught one “um” or “er” or word trip. He pauses appropriately, his words flow mellifluously, and essentially he’s easy on the ear and the eye. His presentation is musical in its tone, and content. At 49:00, as he begins to demo a keyboard instrument, he says: “I can type on that (piano) icon right in the middle there” and that’s exactly what he does, and we share in what comes next. Xander repeats this style throughout his demo, leading us easily as to what will happen next, even if our knowledge of musical instruments is lousy, like mine! 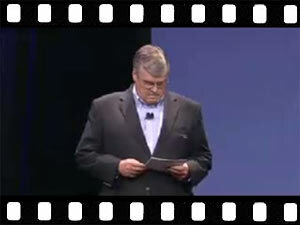 His demo could have been incredibly hard to follow, as I find most of Randy’s for iMovie, I’m afraid to say. But Xander’s presentation style allows me to be comfortable in my ignorance, remain engaged, and share in his delight at the iPad’s capabilities. Xander then takes his presentation to another level, by creating music on several different devices, from keyboard to guitar and drums, and it all sounds so musical. You just want to grab an iPad and play it, even if you don’t know a G string from a boombox. 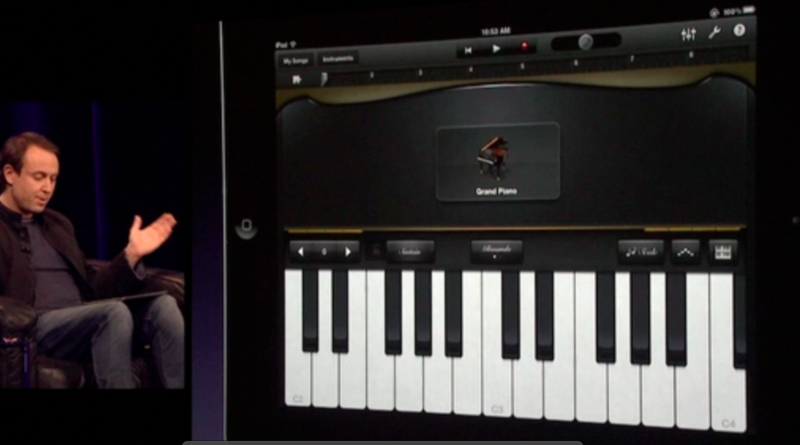 Of course, the “wow” factor is helped by Garageband’s capabilities, turning the iPad from the critic’s “toy” into something you can expect professional musicians will use on stage. I imagine they can put three iPads side by side (the picture below shows 15 white and 11 black keys) and get a full keyboard, each with its own octave range. At 1:00:00 Xander finishes his presentation with words of encouragement to us, his audience, stating Apple can hardly wait to see what its users come up with once they get a hold of iPad with Garageband. It’s hard to believe he has packed so much into just 13 minutes – less than a standard TED talk. Jobs walks back on stage, momentarily flummoxed himself! "I dont believe what I just saw"
In conclusion, if you’re a presenter of any material – technical or otherwise – you owe it to yourself to watch the iPad 2 keynote and in particular Xander’s performance. And then watch it again to extract all the presentation magic and musicality you can. It would not surprise me at all to learn that Xander also plays a horn instrument, such is his breath control throughout his performance. I think soon I’ll have to write that blog article about how to control for all those off-putting “ums” and “ahs” and other connectors that connote nervousness and possible lack of preparation and rehearsal. 1. 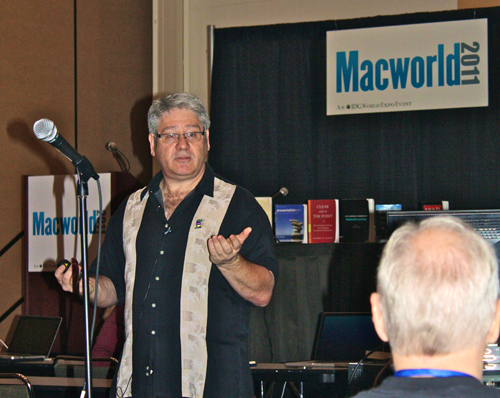 From Ron Albu, the President of the Hawaii Macintosh and Apple User Group, click here. 2. From Gary Bowman’s blog, here. The picture at top was taken by Gary who kindly allowed me to post it here. I will give an extended description of the full day workshop in a blog article to come, but I was very fortunate to have two senior members of the Apple Keynote team attend. They observed the workshop and listened closely to other attendees and their desires for how Keynote ought to evolve. Of course, I also offered demonstrations of Keynote’s strengths and weaknesses in the hope it might add to some future feature set. The day after the workshop, I offered a User session of 75″, featuring Keynote on the iPad. 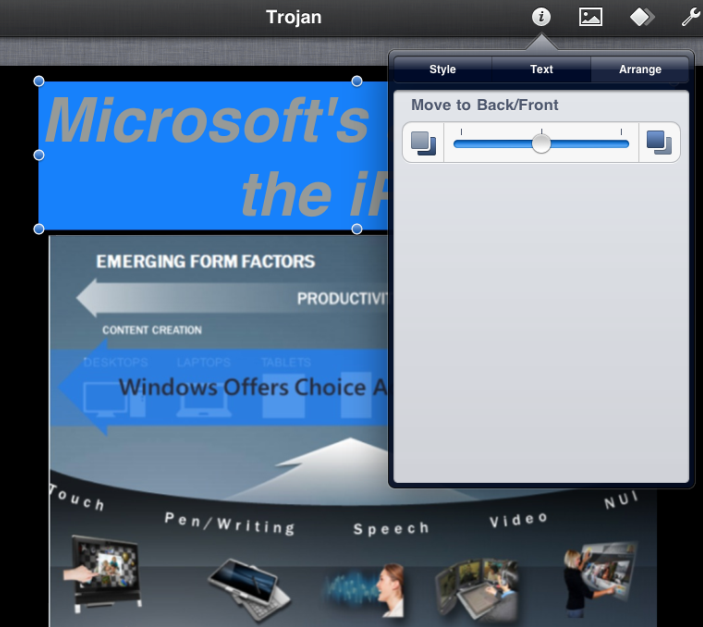 At the time, Keynote had just been updated so that it could now operate in presentation mode, just like its older sibling on the Macintosh, and it also featured presenter notes. I had to admit to the group present that I only occasionally use Keynote on the iPad for presentations, as usual files have until now been much too media rich to survive the transition to the iPad. I do use the iPad version almost as a sketch pad to jot down ideas for a future presentation much the way others might use a “back of the napkin” pen and paper technique to record ideas. That said, as I do for most workshops, I started this session by placing the iPad in some kind of historical context, by firstly saying that I had written about my desire for a tablet and Keynote application for it in later 2004, here. 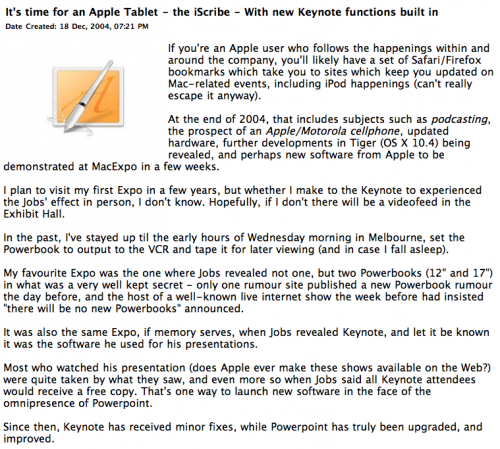 I include this screenshot (do go and read the rest of the article where I mention Keynote magic) so as to give you a date at which I first thought about tablets and Keynote for presentations. So after this curious introduction, I then spent some time showing screenshots from the webpages of some fairly well-known iPad naysayers who shortly after January 27, 2010 when the iPad was first shown (my presentation also fell on January 27), roundly criticised the device as Jobs’ folly. It so reminded me of the reviews the first iPod received almost ten years ago, when it was greeted with much mirth from pundits who wondered who would spend $399 for a 5GB mp3 player. Who, indeed! Now a year later, I showed the same critical pundits display long term memory loss (or active avoidance of their own short sightedness) since they were now lauding the iPad and criticising the wannabees still to find their way to the marketplace. I suppose when a device has been the fastest selling device in history (according to some estimates) and has 90% of marketshare, it would be awkward to not laud it. With the humorous pokings at the tech media out of the way, it was my turn to take aim at what might be a surprising target: Keynote for Macintosh users. If there was a group who were most vocal in their disappointment with Keynote 1.0 for the iPad, it was Keynote 5 users. Like me, they too had long hoped for some other ways to use Keynote, and when the iPad was shown on January 27, 2010 in a demo by Phil Schiller, the belief was formed by many that it would merely replicate the functionality of its bigger, older sibling. Of course, once they paid their ten bucks and began bringing in their large, multi-build, multi-transition and multi-font desktop Keynote files, disaster struck. Keynote for the iPad lost many of their carefully constructed builds, could not handle animations, lost fonts, and worst of all, lost the ability to maintain groups, whereby images and text could be grouped as one image for various builds and effects. Oh, and not to mention the absence presenter notes and no presentation display such that current and next slides could be seen adjacent to each other (since corrected in the current version, 1.0.3). Keynote could display out to a projector, but it couldn’t even operate in mirror mode. But in laying some criticisms at the feet of my Keynote-using brethren for having such high hopes even though we all knew the very low processing and graphics power of the iPad, I also suggested to them that if one had come in from the cold of the land of Powerpoint for Windows – again, all simple text slides and minimal use of animation and transitions – Keynote on the iPad would prove to be a delightful revelation! I suggested that such users, perhaps purchasing their first Apple product (or their second after their iPhone) would nonetheless be wowed by Keynote for the iPad with its albeit limited transitions and builds. But limited in this case is a subjective term, given the low level of advanced presentations one sees in workshops and conferences. For this group, Keynote on the iPad could open up new possibilities, in much the same way those of who first began using Keynote for the Mac in 2003 had discovered a new way of producing visually rich presentation styles. I went a little further, and noted that Keynote for the iPad was clearly a very popular app on the App Store to judge by its published rankings, and that the engineering team had produced three updates in a year, while the desktop version was still waiting for its impending update after more than two years waiting. Now we know where all that energy has gone – the Keynote team is not a big one, and Apple has limited resources after all. What I did say too is that I expected there to be increasing parity between the feature sets of the two Keynotes, so that one day there will be easy transfer between the two platforms with no loss of functionality. Indeed, in at least one respect, Keynote on the iPad is ahead of the desktop version, in ways that suggest what we may see in a the next update. I’m referring to the ability of Keynote to layer objects on a slide, and move them forward and backward relative to other objects. I see feature parity between the desktop and iPad versions as the next goal, with perhaps feature sets unique to the iPad to take advantage of its useability much like we see now in its versions of Garageband and iMovie. Who knows what the gyro might mean for presentations! Now that iPad 2 has arrived with its twice as fast processor and “up to nine times as fast” graphics processor, I fully expect Keynote to be updated on the iPad perhaps to version 2, and coincide with the release around the same time, of the desktop version. Don’t lay bets on this, however, as guessing when Keynote will be updated is like asking when QuarkExpress would move from System 9 to OS X (for those who remember what a laggard it was). So with sales of iPads exceeding even Apple’s expectations (as was told to me by the Apple crew who attended my workshop), I return to something else I discussed and showed in my User group presentation: that I believe the iPad, and Keynote with it, is acting as a Trojan Horse to move Apple products into industries and sectors where they have been unwanted by the IT leadership for various reasons, cost and security being primary, and “it’s not Microsoft compatible” being in the mix too. The story of the Trojan Horse is of course a wonderful metaphor for the secret intrusion into well-guarded locations of troops who would bring mayhem once released from the wooden beast in the dead of night. In the iPad story, it’s not CTOs who are asking for the iPad to come into the enterprise, but it’s coming from both ends – workers bringing their own iPhones and iPads so as to better get work done – and CEOs who have discovered the delights of these products, much to the chagrin of the security minded IT departments who inwardly scream about another system to learn about, especially after years of sniping at the little computer company who could. 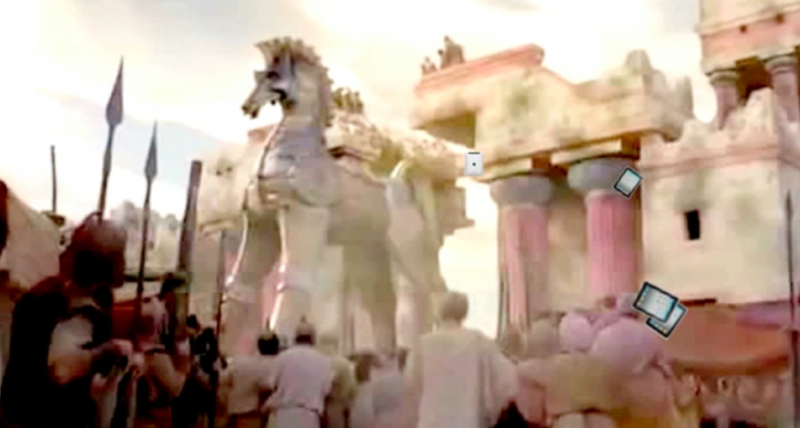 So for my workshop I created the video below to represent the story of the iPad acting as Trojan Horse. Watch it to the very end, and I’ll tell you more about it. 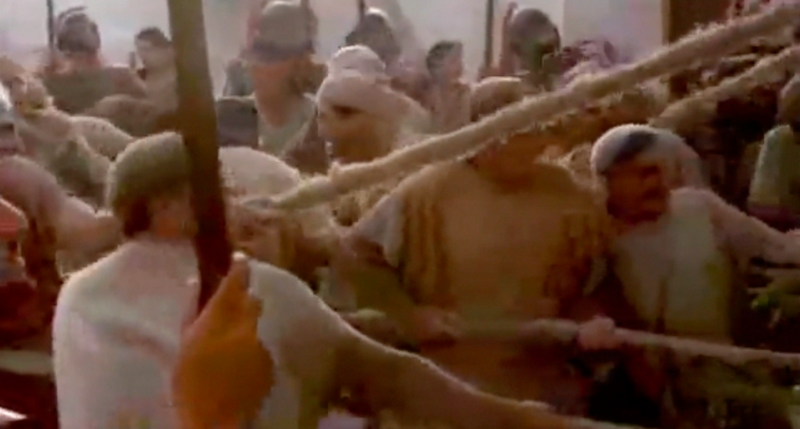 The video was gathered from YouTube clips of the movie of the Trojan Horse from a few years ago, and the mp4s downloaded moved into iMovie 6HD for editing so as to get the sequence I wanted. The sound was also heavily edited. The video was then exported as an mp4 into Keynote, where the pictures of the iPad were duplicated into a grouped array, and then used with a motion build to move in almost precise timing with the Horse saddle as it moved into the walled city. Later when the beast has come to a halt, the city leaders inspect it (pictured below), and I described these as being the C level personnel: CEO, CTO, CMO, CFO etc, all somewhat flummoxed by the appearance of this beast, little knowing what was in store for them. At the conclusion of the video, I use various rotate, scale and motion path effects to create the images of the Horse basically taking a crap using iPads, metaphorically suggesting the iPad would crap all over its competition, as well as making the early naysayers (neighsayers?) look like horses’ asses. As I read the various reviews of the iPad 2, there is a curious dichotomy. One group expresses disappointment that iPad 2 didn’t go far enough in improving upon iPad 1, yet their suggestions as to what ought to have changed are the same old laments: no USB, no Flash, not 128GB, and the all too familiar wail of Apple’s closed garden. Others are delighted to see the evolution of the iPad with its cameras, new form, and improved processing power. I fall into the latter camp, and look forward to seeing if my predictions of parity between the two Keynotes come about due to these improvements which now doubt will occur on an annual basis. In fact, I fully expect Keynote on the iPad to one day have unique features not in the desktop version which might make some consider it as their primary presentation creation tool. Now that would truly fulfill the role of the Trojan Horse!